The novel is a first person narrative of an entrepreneur who struggles to make sense of his life. He reconstructs his memory while recuperating from a nervous breakdown. The distortion in his narrative is not only the manifestation of psychopathology of his mind but also an exploration of human values. The novel demonstrates how optimism incorporates meaningful semantics even in the face of psychopathology. The dualism of hope and pathos creates a touch of absurd, almost reminiscent of Kafka and Camus. 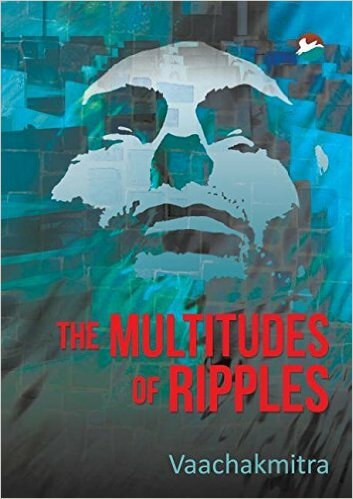 “The Multitudes of Ripples” is a very peculiar and different book which doesn’t hit the market often. There were times that I felt that this book was not for me but gradually I started getting involved in all the Mohmayi visits. The author was careful in detailing every single aspect of his sentences, his experiences and travels. But I found that extra detailing quite unnecessary. With a subject as wide and imaginative as Fantasy World, author should have transpired the characters, incidents in a more dramatic way, hiding some meaning, showing some unexpected imagery's. Plainness is not always good. There were abundant characters along with the narrator on this journey and I loved everyone. When more people were exposed to Mohmayi, things started becoming a little comical because there was more variation due to this. Themes of the book were of great range, family love, the bond between siblings, with the caretaker, loved one. I enjoyed the former years of the narrator’s life the most because I felt that the Mohmayi sounded more convincing then. Seeing everything from the eyes of a kid was much easier than seeing things from the point of view of an adult. I felt that author should have concentrated a little bit on conversations, the narration was nice but not very effective, and with extra explanations in the brackets, one expression became quite a lot to intake. A reader who is not used to of reading psychological anecdotes can find it a little bit boring. The book can be read in order to understand the critical yet interesting life written to showcase a fantasy world in autobiographical form. The author is a research scientist by training. He is technical consultant who works in an advisory capacity to the pharmaceutical industry. He specializes in intellectual property, technology upgradation and information technology. He is a science writer specializing in theoretical and philosophical foundations of modern scientific thought.